IMPORTANT - Restrictions on use Landing anywhere you like in the valley is NOT an option. Some of the farmers will be very unhappy if you land in their fields. Without a negotiated landing field there is to be NO flying. We do have very good landing options - please take the 10 mins to ask the relevant (and very friendly) farmers / landowners. While there is no specific restrictions due to lambing it is paramount to call in at Millbeck farm to agree which fields are to be used for landing (At the moment the Club Wind sock is once again missing April 2016) - So please mark the agreed field with your on wind sock and inform all flyers of the correct field. I will look to get yet another Club windsock ASAP. A rugged mountain site overlooking the beautiful Langdale valley set amongst the peaks of the Langdale Pikes. From Ambleside, take the A593 to Skelwith Bridge. Turn right onto the B5343 through Chapel Stile and on to Langdale. 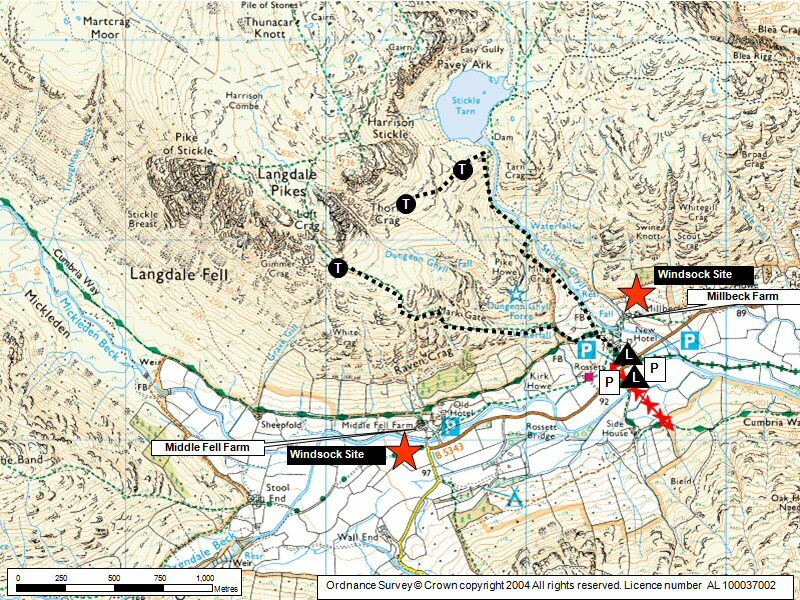 From the parking areas in the Langdale Valley near to the New Hotel (NY 296065), make for Thorn Crag via the Stickle Ghyll footpath or the path running between Pike Howe and Dungeon Ghyll. Either route is steep and sustained. At Thorn Crag a decision can be made, according to the wind direction and strength, to take off here, in front of Stickle Tarn or to the left of Gimmer Crag. 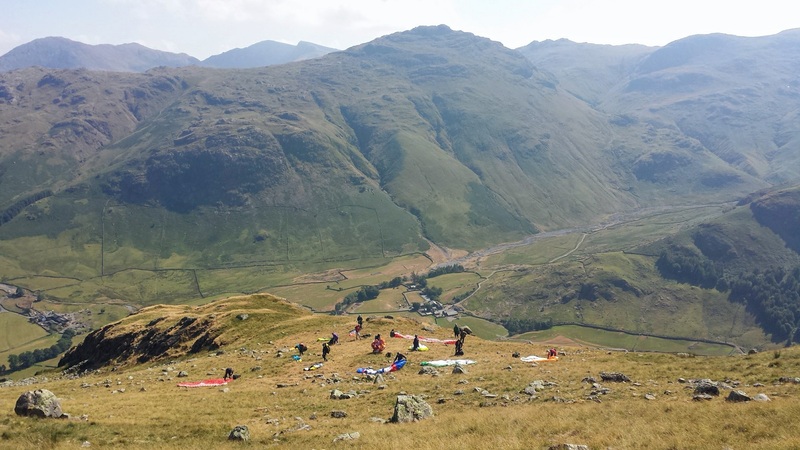 Anyone flying from the summits around the head of Great Langdale should contact Middle Fell Farm, next to the Old Dungeon Ghyll Hotel (NY 285061) AND/OR call at Millbeck (NY 296066)behind the New Dungeon Ghyll Hotel. They will generously advise on a suitable landing field specific to that farm. This is a big site set amongst some of the bigger hills of the Lake District. This site is not for low airtime pilots. Be careful of a sea breeze that can set in and bring with it a rapid change in wind direction and turbulence. Some of the available landing fields have difficult to see telephone / power lines across them. Take extreme care on any landing approach. This is a big site and if there is any appreciable wind in the valley then it is more than likely that it will be blown out at take off. Best in very light or nil wind conditions when the (large) thermals can form over the vast areas of scree and fellside. 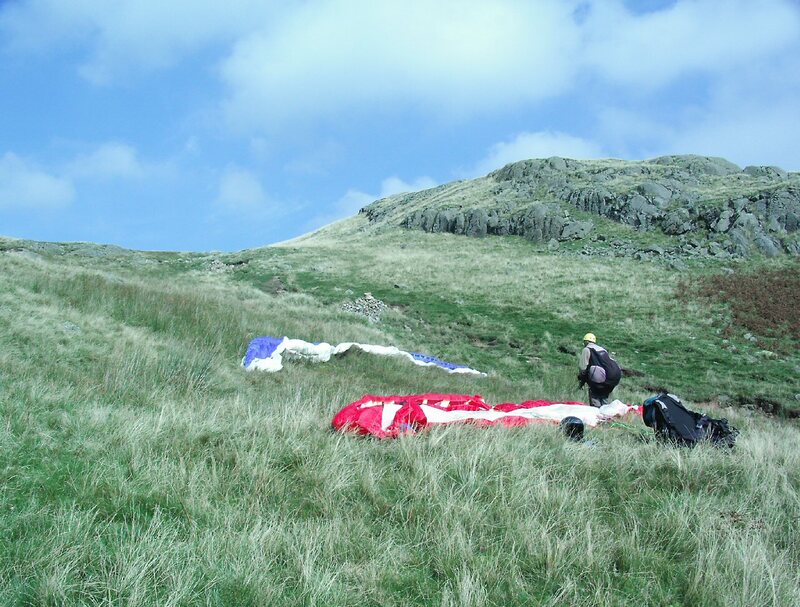 If tracking along the valley to the east then be aware of the restrictions on landing fields in the valley. If in doubt land well up on the fell side and walk down. An almost impossible carry up. Excellent potential but the terrain is wild and demanding. There is the potential for a very long walk out if you have to land out. 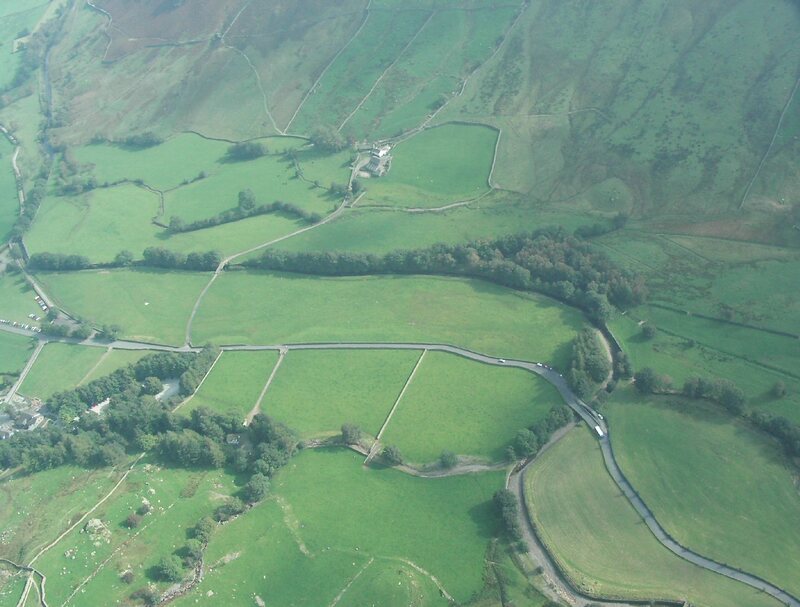 Looking down from a paraglider to the eastern end of the Great Langdale take off area. 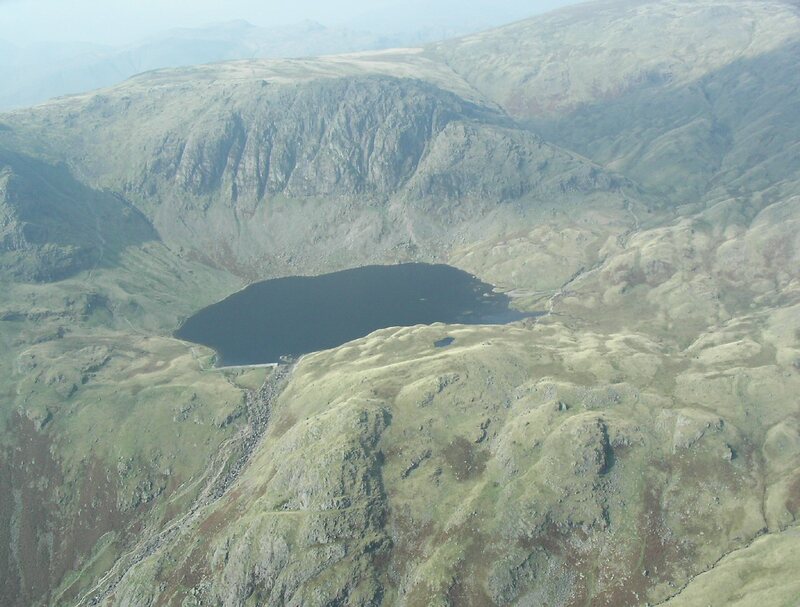 Stickle Tarn is in the centre of the picture with Pavey Ark behind. The eastern flank of Harrison Stickle is in shadow. Stickle Ghyll and the main trade route up to the tarn are in the front of the picture. Picture by Pete Rycroft. Preparing for take off. Taken just below Stickle Tarn to the west of Stickle Ghyll. Picture by Pete Rycroft. Looking down on the landing fields. A glider can be seen in the eastern half of the landing field which is divided by a track to the farm at the top of the picture. A power line traverses the field which can be easily avoided; however, the landing field should be inspected before flying. Picture by Pete Rycroft. Notes : A flight from Great Langdale, north through the lakes and then NE to the A69 NW of Haltwhistle. Jaysen Metcalfe who started the flight with Bud says "It was very West on take off and the only way up seemed to be from a thermal from White Ghyll. Several of us landed in Grasmere into a strong south wind but Bud thermaled up low 200 ft up from the Travellers Rest up and along the ridge to Clough Head. We were all quite glad to land. As you can see from his track log he just skirted the Carlisle air space."